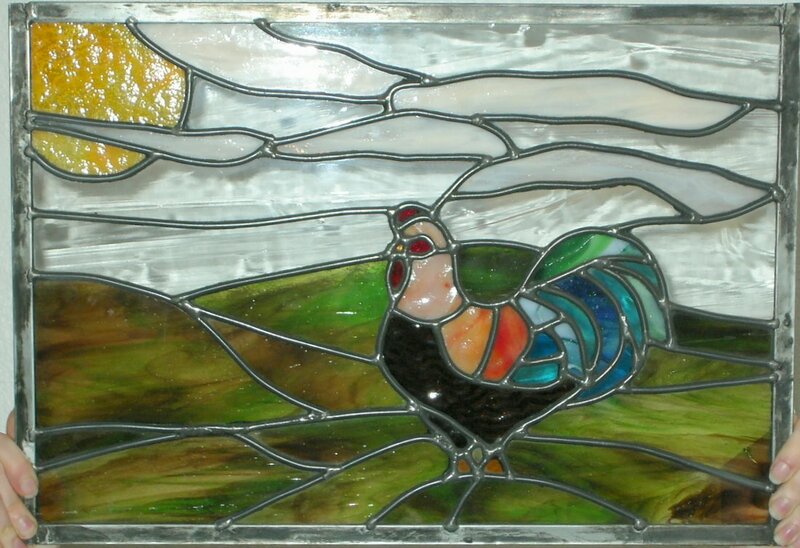 Danielle started working with stained glass in 2006. Two of her early works are shown below. While our house was being constructed, Danielle worked on some stained glass panels for the house. She completed a major one for the master bath. This shows two smaller, simpler panels that are hung in the windows in the master bedroom above our bed. Panels for over the kitchen cupboards had to wait until the house was complete so we could get accurate measurements. This was Danielle's first panel. We enjoyed it in our front window of our old home before we moved. It is now in a dining room window. The picture was taken through our front window so you can see the fence, grass, and trees through the clear beveled sections of the window. This is another of her early pieces. It is a Calla Lily. 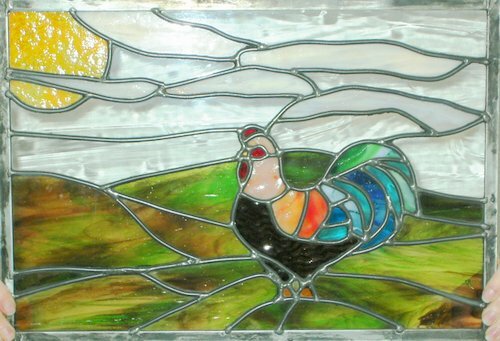 Danielle created this piece for a neighbor who really liked roosters. This was her first design work. We didn't start taking pictures until she already had cut the glass. She had laid out the pieces before adding the zinc framing. She was working on the kitchen table of our old home because her "glass shop" was full of boxes that we used to pack things for the move. She had installed the zinc framing but had not begun soldering yet. No wonder she likes making stained glass. They use horseshoe nails to hold things in place as the panel is built. Completed panel. Temporarily it was in the front window of our old home so the light could shine through it. That accounts for the dark frame in the center of the picture. These panels were installed in the master bedroom of the new house above the bed. Danielle took this picture of her most significant work so far. This is her own design. She thought every garden tub have a garden. It was completed before we moved and it is shown here before being installed. It is about 3 feet wide. Unfortunately we don't have any pictures of its being constructed. Here the picture has been installed in the master bath above the garden tub. It is lite from behind. Here is the completed, backlit panel with its frame. Danielle built a total of 8 panels for over the kitchen cupboards. This view shows 6 of the panels, the other 2 are on ends of the cabinets beside the sink and don't show here. The panels are backlit. You can click the image to see a larger version (301 KB). The panels were designed to complement the shades on the hanging pendant lamps. They match chandeliers in the dining room and rear foyer and floor lamps in the great room. The lamps have actual Tiffany glass but were built by another company. This view shows one of the end panels.